This template is the second version of LK Magazine Premium Blogger Template.I hope you will like it.It has many more premium features than its first version.Give your ideas about this templates leaving a comment.You can download this premium blogger template from here for free and read the article for template configuration. Replace DESCRIPTION HERE,KEYWORDS HERE,AUTHOR NAME HERE as below. Go to Layout-->Page Elements and click on "Add a gadget". Select "html/java script" and add the code given below and click save. Change 5000 to change your slider speed. ENTER-YOUR-POST-X-LINK-HEREs with your real post links. THIS-IS-FEATURED-POST-X-TITLEs with your real post titles. 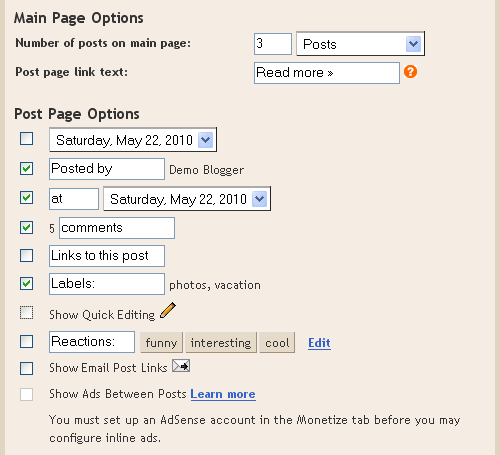 FEATURED-POST-X-DESCRIPTIONs with your post descriptions. FEATURED-POST-X-IMAGE-ADDRESSs with your real image addresses. Replace these lines with your tab contents. Find below code in your template. Now replace "http://themeforest.net?ref=wam8387" and "http://4.bp.blogspot.com/_T46SliM0-PI/S_VK7D-QSNI/AAAAAAAAAM8/KfE0GynX7KI/tf_125x125_v4.jpg" with your details. Login to your blogger dashboard--> Settings- -> Formatting.Now set your timestamp format as the picture below. Do not remove Footer Credits. Excellent template.I really like it.Thank you. How to show related articles in the blog? Should I have to change any code? You don't need change any code.But you must add LABELS to your blog posts. how do u get the youtube video to work? Now replace, "ENTER-TAB1-CONTENT-HERE" with your converted youtube code. why I cant see a new page that i create? I can not understand your problem clearly.So can you explain it further?Also give your blog url. Thanks for help. And one moe problem, how to display other banners instead of themeforest (4 squares). 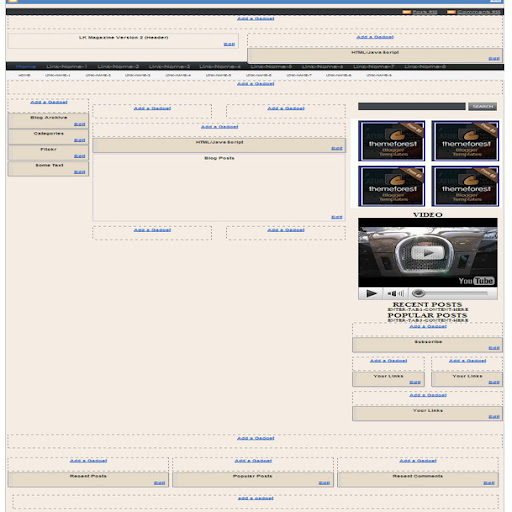 I updated the post.Read it to Configure 125*125 Ad Banners. when i post the preview of it shows alot more than i want it too. can you get the preview of the post to show less of the article before someone presses read more!? Thanks and Great Template btw. What the use of this favican address. Please tell me. I can not see Numbered Navigation on my blog, instead I see an image. Help me please! My blog is http://www.baueletronico.com/ patiently wait your help. Hey please help me for this too. should I have to create account for various social bookmarking site to use the social book marking icons use. Should I have to change any coding. You want to create accounts in social bookmarking site,to use social book marking icons yourself,in this template.But it is not essential.Because these social icons mainly for your visitors,not for you.Also you don't want to change any code. i have trouble when i change video. XML error message: The reference to entity "hl" must end with the ';' delimiter. but my yahoo emotion comments does not work, how to fix it..
Below I have expained how to add a youtube video to your tab view widget. OK , I got it. thanks for your tips. but i have another problems. can i put ads google into 125x125 ads banner. google ads HTML both images and text ads also can not appear on side bar and below post title so i delete html ads below post title. i dont know, i still can`t see side bar ads , you can see on my blog, near "amazon best seller. please help me. thank you so much. sorry i ask you too much. i`m a newbie. thanks before. Hey How can the use the social book marking set used at the last of every post in this template to my other blog, i want to use the same size. Please help me soon. Thank You very much, you are a real hero and so helpful. Your response is too fast. I really like your blog and in future I will always call you for any help. Thanks once againg and your tips works well. Hello Bro. Thanks for wonderful tips above. Can you do me a favor... I ve difficult ho put the link in widget. The link has used the capitall letter. When I save the script in widget, it change to small letter again. Can you help me? Remove "text-transform: lowercase;" from your template. I want to change it to the white background same with the above section. Thanks Lasantha. Hey, thanks for a very nice template. I have one question, Can we change the background and the header color from black and gray to some other? delete ENTER-TAB2-CONTENT-HERE text and now enter your tab2 code here. delete ENTER-TAB3-CONTENT-HERE text and now enter your tab3 code here. 1.i want to replace VIDEO,RESENT POST & POPULAR POST button name and want to add my own name. how im do this edit..please explain me. tnx!!! its a great template. im using it now but iwant to change the background color. wil u pls help me how?!! how to i get the featured content sLIDE to show up on my home page ONLY! !